Monoline writing has no shades. There are no thin and thick strokes as with copperplate, engrossers’ script or spencerian. That means even, light pressure on the pen, which allows nibs to last longer. When one thinks of monoline writing, thoughts tend to business penmanship. However, that is a small part of our writing past. When the Remington Company introduced the typewriter in 1874 (the same company that made rifles and pistols for the Union Army during the Civil War), it spelled the beginning of the end for the clerk/penman. The clerk/penman became the clerk/typist. That hardly meant the end of penmanship. 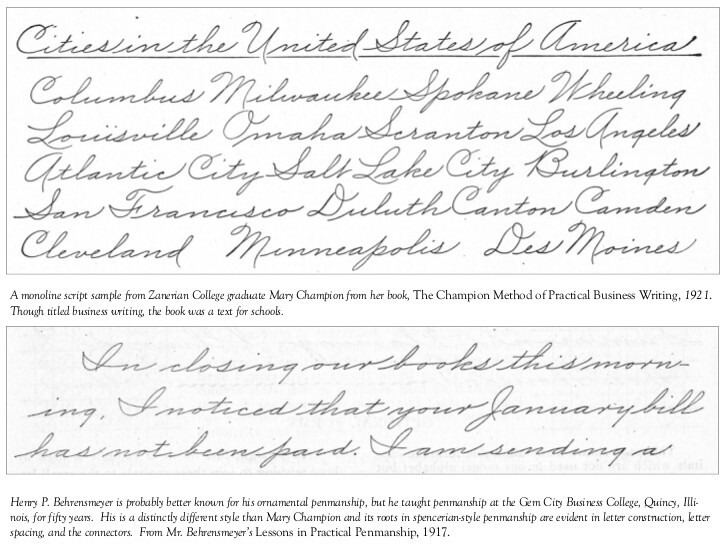 Good, legible handwriting was still prized in business and it flourished in schools where entire penmanship departments oversaw handwriting instruction. A person with outstanding handwriting was viewed as someone special and monoline script was the style most practiced. Nibs for monoline script reflected the prized nature of the penmanship and the intense competition among the various suppliers for the public’s patronage. These steel pens were among the most ornate ever produced. Gold plated, silver plated, plus nibs colored in bronze, blue and green were common. Color could be obtained by selectively heating the nib in its final manufacturing stages. 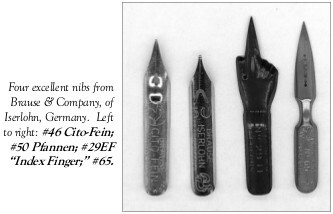 Many companies licensed nibs from the various manufacturers. One could buy a pen with the Sears name on it or Rexall Drugs, to name only two. Nibs made for the Pennsylvania Railroad, Metropolitan Life Insurance or any number of companies show up from time to time. All were for monoline writing. Monoline nibs have one common trait: They are very, very stiff. A slight shade could be rendered, but only with a lot of effort. They also tend to be quite long. None of the monoline nibs was ever meant to be used in an oblique holder. Due to the even pressure required for the formation of letters, straight penholders were deemed more practical. Monoline penmanship with the steel pen has been pretty much relegated to history’s dust bin, but I, for one, enjoy using the old pens. Not only can they accommodate inks and paints that would destroy any other type of pen, but monoline steel pens also make very good drawing pens. 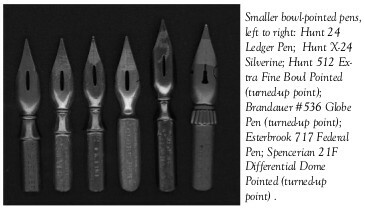 Sometime in the latter third of the 19th century, pen manufacturers began offering steel pens with what they called turned-up points. 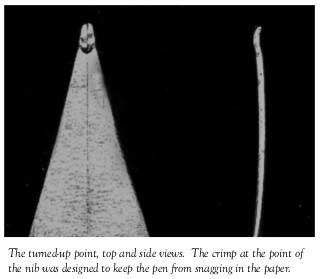 It was a crimp at the point of the nib that kept the point from snagging in the paper and was a terrific innovation. Since the universe of monoline nibs is so vast, surveying even a decent fraction of the pens is far more than may be accomplished in a small article. The good news is that vintage nibs in this category are readily available and very inexpensive. As this survey was being written, there were no fewer than eight boxes of monoline pens to be discussed here that were offered on Ebay and not a one received a bid. Equally good news is that there are a number of excellent pens still made today. This survey will focus on pens readers are likely to actually find: modern nibs and vintage points most commonly found on Ebay. As in previous reviews, modern nibs are listed in bold type. Every pen mentioned here is a terrific writer in the fine to medium point range unless otherwise mentioned. 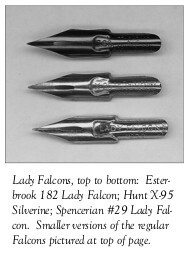 The most common design among vintage points were the Falcon pens and the “Bowl-Point,” noted for their keyhole-like eyelet. These were also called “Bulb Points” or “Ball Points.” Of the latter, the Hunt 513 is still made. The group in the above photo is only a sampling of those pens available. If you see a similarly designed pen not listed here, be assured that it is probably as stiff and with a medium point as the nibs shown. 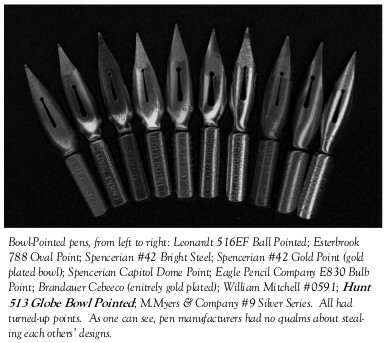 Penmakers also offered smaller bowl points. These tended to have finer points and did not always have the turned-up point. 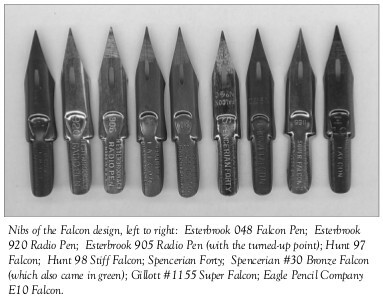 Falcon-style nibs were the most popular pens of their time, led by the Esterbrook 048 Falcon. The 048 was the all time best seller. Falcon pens did not usually have the turned-point, but were excellent monoline writers. As with the Bowl Points, the Falcons listed here are just a representative sample. Falcons of every make and model appear frequently on Ebay and are basically the same pen: fine pointed with a bit more flex than bowl points, but not much. So popular were the Falcons that manufacturers created “spin-offs,” smaller Lady Falcons. They are equally stiff, but are small enough that they could work comfortably in an oblique penholder if one so chooses. A few vintage monoline pens had very fine points. 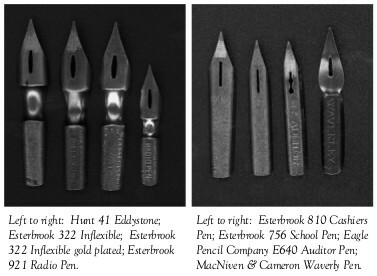 The Esterbrook 322 Inflexible and its smaller cousin, the Esterbrook 921 Radio Pen are two. The Inflexible definitely lives up to its name and both are excellent writers and drawing pens. Hunt had an almost identical model in the #41 Eddystone. Other good pens that show up on Ebay are the Esterbrook 810 Cashiers Pen and the Esterbrook 756 School Pen. The latter, with a turned-up point, is smaller and will work in an oblique holder. It is stiff, but very fine. Not only is it a great writer, but also works as a drawing pen. The Eagle Pencil Company E640 Auditor Pen is another very fine tip, but without the turned up point. The Waverly Pen, made by Scottish penmaker MacNiven & Cameron, is included because it appears on Ebay so often. It is a good pen with a slight flex and a medium point. I suspect that it is equally popular for its wonderful tin box. There is a rich selection among nibs manufactured today for monoline writing. Aside from the aforementioned Hunt 513, there is the Hiro 700, made by the English firm of D.Leonardt. It is small and super stiff. A good nib, it is also a good drawing pen. The German penmaker, Brause & Company (marketed by Exaclair, Inc., of New York City), manufactures four outstanding nibs for monoline writing. Its #65 is an arrow-shaped pen that is super fine without the turned-up point. The #29EF “Index Finger” is also super fine, but with a little more flex. Two other Brause nibs have the turned-up point. The #46 Cito Fein is a gold-plated medium-pointed pen. The bright steel #50 Pfannen has a fine point. All are extremely comfortable pens and handle a variety of inks quite well.